Beckett Message Boards - Awesome hobby weekend! Beckett Message Boards > Hobby Talk > Hockey > Box Breaks > Awesome hobby weekend! Full Version: Awesome hobby weekend! Unable to pick up a full box yesterday (as they were sold out,) I decided to pick up a handful of random packs at my local news shop. At this particular shop there's no way to pick your own packs, because they're stuck in a pack dispenser behind the register, next to the lotto tickets, so the cashier is the only one who can dish them out. Must have been my lucky day, because I did surprisingly well considering what I ended up picking up. 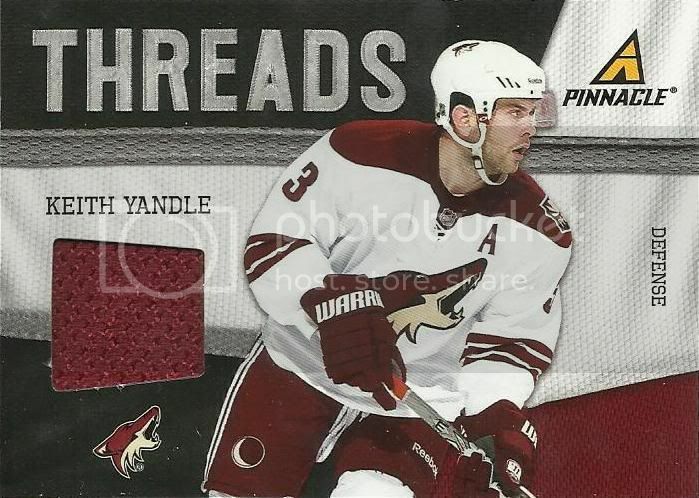 I bought three packs each of 11-12 Black Diamond, 11-12 O-Pee-Chee, 11-12 Pinnacle, 10-11 Pinnacle and one single pack of 2011-12 Artifacts. How can I complain? I spent less than $50 and ended up pulling quite a few nice cards. 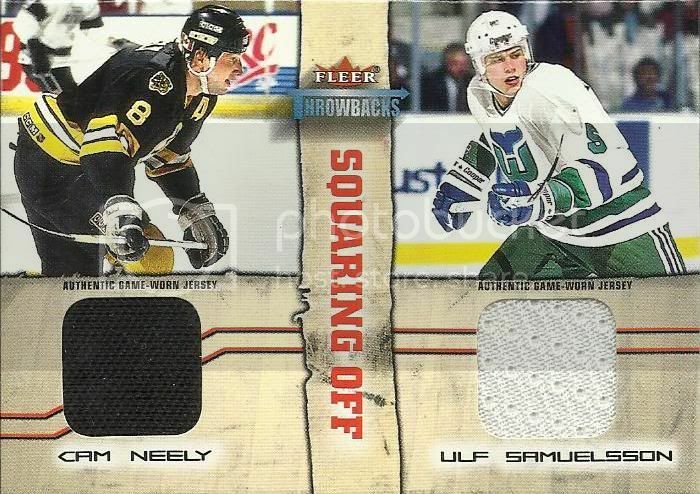 A card featuring my all-time favorite, Cam Neely, and my all-time least favorite and most hated player, Ulf "Cheap-shot" Samuelsson. Eventful day, for sure, and it just kept on coming. I set an alarm to pop online at 2:30 in the morning to see if anyone had bid on a card I had my eye on. Still zero bids on this thing with just over a minute to go, so I threw down the minimum bid on in, just to see what happened. Just over a minute later, I was the proud buyer of a 2011-12 Artifacts Black autograph of Patrick Roy, #5/5! To top it off, I threw a bid on an Eric Lindros autograph tonight, and won that as well! That's two bids, two wins, and two incredible new additions to my all-star PC, in two days. It makes up for the trades that I had that would have landed me a Brodeur and Fuhr autos, for sure. Tomorrow I'm going to sit hit a local card show with a pocket full of high end traders, and when I get home, I'm going to back and try to make some more trades to hopefully get that PC chugging along. Everything pictured (except for the Neely/Ulf dual jersey and the RNH Black Diamond RC, those are PC) will be available for trade for my far-too-many PC's. nice pulls... I could use the RNH, I just pulled a Neely gemography auto if you might want that for starters? Hanging on to one copy of each of the RNH rookies I pull, but I've still got a bunch of stuff available. Check me for the Neely for sure, I'm interested in it. Pulled a nice Pinnacle Game Night Materials Prime of Datsyuk, and also threw a couple of his jersey cards that were formerly PC into the org for trade. Have a look and see if we can make something happen! Wow! That is some fantastic luck, Chris!!! Congrats on the amazing hits from the random packs, and the great mail/eBay day! I bet you would love to be able to mangle the other half of the Neely card without consequence, huh? Haha! Awesome story, and thanks for the great read! Great story - Good things do happen to collectors every now and then !!! No J.J., the card backs states that it's from a Flyers jersey. Nice pulls Chris!!! You have the best luck on random packs. Congrats!!! Love the fleer throwbacks dual ! !